If you’ve browsed your way to this page, chances are you already know what this product is about … but just in case, here’s a quick summary. 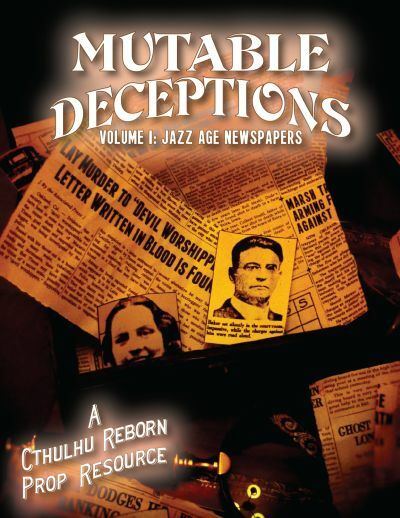 Mutable Deceptions, Volume 1 is a commercial prop resource that we have released to help gamers with the perennial problem of making their own realistic-looking 1920s or 1930s newspaper props. 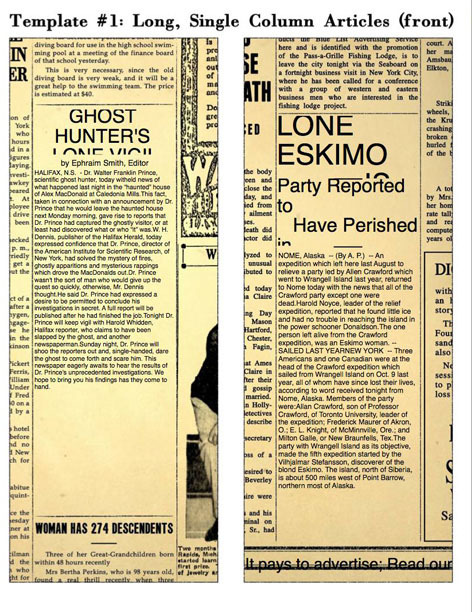 Many games — Lovecraftian roleplaying games in particular — place a heavy emphasis on newspaper clippings as clues, but making ones that look authentic is actually pretty hard. The templates that come with Mutable Deceptions make the job much easier: all you need to do is pick one of the 14 differently sized/shaped/formatted templates, open it up in Adobe Reader and type your own text in for the headlines, bylines and article body. You can even do some substantial formatting of the article body to squeeze text together or space it apart so that your text fits into the template field just right. OK, so enough with the product summary. Higher-res version of the Instruction Booklet: The downloadable product includes a 12-page booklet with instruction and helpful tips on prop-making. To keep download sizes reasonable, the bundled version has its images compressed a bit … if you’d like a higher-res version of the book, it’s available for free download (7MB PDF). This is also handy if you haven’t bought Mutable Deceptions, Volume 1 but would like to know more about what it can and can’t do for you. Jazz Age Fonts: All the fonts used in Mutable Deceptions, Volume 1 are versions of things that are available for free online. Some of them have been slightly tweaked by us to look a little less crisp. While you don’t need any of these fonts to be installed on your computer to use the product (they’re all embedded into the templates PDF when you buy it), some folks might like to play with them for other projects … if so, feel free to grab this ZIP file (361KB) with all the fonts collected together. Click “File” and “Download” to save a copy of the full ZIP to your computer. Credits for these free fonts (and links to their original sources) can be found at the back of the instruction booklet PDF. The templates included with Mutable Deceptions, Vol 1 have been designed to work with Adobe Reader (version 9 or later) and have been extensively tested on all common versions of that software. However, PDFs being the complicated beasts they are … other (non-Adobe) PDF software and cut-down versions of the Adobe Reader for tablets don’t necessarily implement all the features needed to make these templates work. Adobe recently released cut-down versions of its Adobe Reader for tablet OS-es. That is a wonderful thing … but the reduced functionality of these smaller versions only partly supports the functions used by Mutable Deceptions. Specifically, the newspaper templates (filled in with whatever data they had when last saved) will display fine when you open them in the tablet editions of Adobe Reader, but the form fields aren’t recognized as editable, so touching them doesn’t allow you to edit their contents. This makes it impossible to edit articles on an iPad or Android tablet … but if you’ve already made an article (on your PC or Mac) and then transfer it to your tablet you can display it for your players to stare at in awe. More material — and perhaps some pics of creative uses to which folks have put the Mutable Deceptions 1 templates — will be added later. We hope you enjoy the Jazz Age prop newspaper resources included in this product and can find loads of intriguing and creative ways to integrate them into your game! I’m using Acrobat XI (on a Mac, if helpful) and and getting the same look of documents that I see above in your “bad fonts” section. I downloaded and installed all of the fonts, just in case, but am still seeing the same problem. This comes up on screen, in print previews, and printing. Any tips on getting this to show up properly? I’ve been adding text boxes manually and fiddling with fonts to see if I can make things look alright. It works, but it seems like I’m having to do a lot of manual work this way for something that seems pretty “fill in the pages” from other people’s reviews. I have to make my own textboxes since the form filling ones don’t allow for changing fonts or sizes. It sounds like something is definitely not right with how the Mutable Deceptions PDF is working with your Adobe reader. The fonts used for the newspaper articles are actually embedded into the PDF itself — and you shouldn’t even need to install the font files to your Mac to do basic things like typing text into the pre-defined boxes (I made the font files available for download to allow more advanced wrangling). Based on what you are describing it sounds like, for whatever reason, your PDF viewer software is not seeing the embedded fonts at all. You can create new text fields using the fonts you’ve installed on your system — which, as you’ve said is a laborious process — but the existing fields aren’t working as they should. I’m not too sure what to suggest to fix your problem — maybe start by making sure the PDF reader is seeing the embedded fonts at all (check File > Properties > Font tab … there should be a bunch of files shown as “(Embedded)”). If the reader knows that the embedded fonts exist but still isn’t showing them then maybe there’s something amiss with the configuration of your reader software. If you can’t resolve your problems, drop me an email: support at cthulhureborn.com and I’ll see if there’s anything I more can do. BTW: as follow-up to this question from Michael … after some investigation it ultimately turned out that the PDF file that Michael was using had been somehow stripped of its embedded fonts by some intermediate copying step (maybe via DropBox). If other people are encountering similar problems the first thing to try is going back to the original files (ideally the ZIP) saved from DriveThru. Yeah – I still can’t figure out what happened to the files, but the issue is resolved. Thanks for the quick help! These are fantastic.